Zhumell offers two models of binoculars for star gazing, the Zhumell 20X80 SuperGiant Astronomy Binoculars and the Tachyon 25X100 Astronomy Binoculars. Both the Zhumel 20x80 SuperGiant Astronomy Binoculars and the Zhumell Tachyon 25x100 Astronomy Binoculars can be used for astronomy and bird watching, wildlife observation, and long distance land and over-water viewing. The Zhumell 20X80 SuperGiant and the Zhumell Tachyon 25X100 are both binoculars that are available at more acceptable prices than binoculars from some of the more established and renowned brands in the industry. However, both these binoculars can compete with better known brands out there on the basis of the lens coatings, quality of prisms, and sturdiness of construction. That said, we'll have a closer look at the specifics of both models. Both the Zhumell 20X80 SuperGiant binoculars and the Zhumell Tachyon 25X100 binoculars use fully multi-coated objective lenses that provide plenty of light for extreme low-light conditions. Their respectively 20- and 25-power magnification brings objects 20-25 times closer than they would appear with the unaided eye. The Porro prisms in the Zhumell 20X80 SuperGiant binoculars and the 25X100 Tachyon binoculars use BaK-4, as opposed to the lesser quality BK-7. Both of the Zhumell 20X80 SuperGiant and the 25X100 Tachyon binoculars have an exit pupil of 4 mm. Exit pupils measuring 4 mm are at the lower end of typical expectations for night viewing. Some binocular configurations, such as an 8X56, have larger exit pupils (in this example, 56mm divided by 8X = 7 mm) which are more suitable for night and low light level viewing. The 4 mm can provide a decent view, however, depending on the amount of light pollution in the area and other conditions. Eye relief with the Tachyon measures 15.44 mm and with the SuperGiant astronomy binoculars it measures 17 mm; both should work reasonably well for those wearing glasses. Not necessarily related to how binoculars work at night, but important to many users is the field of vision. This measures how wide the image will be when looking through the binoculars. Typically measured at 1,000 yards from the viewer's point, the Zhumell 20X80 SuperGiant binoculars have a field of view of 168 feet. The Tachyon 25X100 has a field of view of 157 feet. When considering the distance at which these are intended to be used, what would otherwise be considered a quite narrow field of view in a general purpose binocular is often considered satisfactory in a long-range binocular. Zhumell 20X80 SuperGiant Astronomy Binoculars use center focus and the 25X100 Tachyon Astronomy Binoculars use individual focus. With the center focus one knob in the center of the binoculars adjusts the focus of both barrels at the same time. Individual focus means that, just as the name implies, each lens is focused individually. Military binoculars are typically of the individual focus design since it is not prone to having problems under less optimal conditions. While the individual focus arrangement can seem uncomfortable when one is initially exposed to it, a user typically gets the knack of making adjustments relatively quickly. Additionally, when focusing an individual barrel on the binoculars, there is rarely a need for the same user to re-adjust the focus on subsequent uses. However, using the 25x100 astronomy binoculars with its individual focus for astronomy purposes only will not cause for any problem. When focusing on items on land, although you'll have a short period of becoming accustomed to individual focus, you're not likely to find individual focusing binoculars burdensome. At only 4.4 pounds, you will easily be able to carry the Zhumell 20x80 SuperGiant binoculars on longer journeys you plan to make in order to use the binoculars in certain areas or to escape the city lights when you want to do some serious star gazing. What might really grab your attention is the size of these binoculars. Considering that these binoculars have an 80mm objective lenses and weigh only 4.4 pounds, one can say that these are quite unique, especially considering the price. In addition, these Zhumell binoculars have a built-in tripod mount which allows you to attach the binoculars to standard tripods and makes handling much easier. While the SuperGiant binoculars are water resistant they are not waterproof and might well be damaged by water. However, with reasonable care they can be used at the beach without fear of being damaged. They are designed to protect the inner workings and optics from damage, but they are not designed or intended for extreme weather conditions. As with all binoculars, it is recommended they not be left outside when not in use. Some people buy the Zhumell 20X80 configuration to search for ships and track them on the horizon. With the use of the tripod included in the bundled package deal or a tripod you already own, they can be used for the entire duration of the ship's course across your viewing area. As opposed to those who use them for casual recreation, those eyeing the sky do not feel their weight is an issue, as they typically use them with the tripod, which also prevents shaking and losing their target object from view. Those who have used these binoculars for celestial viewing report they met or exceeded their expectations, although the first unit recieved from the seller was not always the one they kept, usually due to focusing or collimation challenges, and most would recommend them to their family and friends who share similar interests. If you should receive a Zhumell instrument that falls optically or mechanically short of its description, Zhumell's warranty provides for your satisfaction. Zhumell's 25x100 Tachyon on the other hand is a bit heavier, weighing in at a little over 10 pounds. The design further includes a nitrogen-purged construction and individual eyepiece focus which is not unreasonable at the distances one would expect to use an optical configuration such as this. These binoculars can be attached to sturdy standard tripods as well. Since the binoculars themselves are of a sturdy construction, you don't necessarily want to be put off by the quality of the case provided (it's a good quality and has nice, thick foam cushions - just not "excellent") or supplied neck strap. Like a number of binocular brands, Zhumell seems to save a bit of money on those items in order to provide competitive pricing and, to be honest, not many of us are going to be hanging binoculars as heavy as these around our necks! If you've not already used a binocular as heavy as either of these, it wouldn't be unreasonable to think that just about any tripod could be used. Be forewarned though, that these weigh enough to require a sturdily made tripod in order to hold your binocular safely and securely. For large binoculars such as the SuperGiant and Tachyon, we recommend considering appropriate Manfrotto or Garret tripods if possible. While the tripods included in the package deals will be serviceable, the others will be more likely to provide enjoyment over an extended period of time. The Garret 5000 model may be especially attractive for those budgeting carefully. The Zhumell Tachyon 25x100 is completely waterproof. The smaller Zhumell 20x80 SuperGiant however, is not. The Zhumell Tachyon 25x100 has nitrogen purged barrels and is zero grade nitrogen filled to get rid of any moisture in the barrels. This is especially important when they will be used outdoors or in cold weather to eliminate internal fogging. This means that no signs of water or fog can appear on the lenses or prisms within the binoculars. However, as with all optics, this doesn't mean that there will be no fog externally. There are plenty of Zhumell consumer reviews to be found on the Internet for both the Tachyon 25x100 and the 20x80 SuperGiant. Was very impressed with these binocs and stand. Set up is easy, they seem to be very good quality. I don't think you could use them without the tripod though. They are very big. You'd need a tripod, but that's the great part when star gazing. Yet to get a good sky to test on northern lights. I live on the fourth floor, right on the ocean. I wanted something strong enough to view the ships that travel 10 plus miles off shore and these binoculars work super. Also I can clearly see the boats going in and out of the inlet 5 miles away. More importantly I can zero in, with excellent clarity, on sunbathers up and down the beach. Make sure you get the Tripod package as they are a bit heavy for my wife to hold very long. I haven't used the Zhumell 20x80 SuperGiant Astronomical Binoculars Package much yet, as I am waiting for a full moon. However, I have seen stars in the sky I never knew were there. The binoculars and tripod appear to be well made. My son is working on his PhD in astronomy and this is the one he recommended for a beginner. It really exceeded my expectations. I am really enjoying it! I wanted something that would be of quality and get me more excited about astronomy. This is a great start. When purchasing the Zhumell 20X80 SuperGiant Astronomy Binoculars Package, you will receive the "Zhumell Professional Tripod" bundled in with the binocular. Carrying cases are included for both the binocular and tripod. It is recommended to use a tripod with these binoculars, since the viewing may become difficult due to your hands' normal movements being magnified. The binocular and its carrying case are available by themselves, however, and the price is lower than with the tripod, as you would expect. There are quite a few consumer reviews indicating that the binoculars are quite useable, but that the tripod included in the 20X80 package is somewhat lacking in steadiness and overall quality. The Zhumell 25x100 Tachyon comes with a carrying case that will allow you to safely transport these binoculars. After this was originally written, Zhumell began offering a Tachyon package which includes a tripod. We continue to recommend the Manfrotto or Garret tripods, however, for ease of use and durability with binoculars this large and heavy. Both the Zhumell 20x80 SuperGiant binoculars as the 25x100 Tachyon binoculars come with a 25-year no-fault warranty. A no-fault warranty allows you to send back the item so that Zhumell can repair or replace parts on your binocular or even provide you with new binoculars if they can't be repaired, even if you caused the damage. You should be able to find the Zhumell 20X80 SuperGiant astronomy binoculars for less than $150 and the Tachyon should be found at less $250. In our opinion, you'll receive value in either the SuperGiant or the Tachyon - we recommend them as basic, budget binoculars. If you had been considering either of the Zhumell "big eyes," we suggest that you consider the Oberwerk 20X80 Deluxe II or 25X100 individual focus binoculars. We believe they provide better durability and fewer users report problems than was the case with Zhumells. If you're looking for a good binocular buy, you'll probably want to check out our Best Binoculars recommendations. OpticsReviewer readers also value our Binocular Comparisons page which compares binoculars, tells which we would choose, and explains in detail why we would choose that one. Truly impressed with the quality and performance of this unit. It's a bit cumbersome and does really require monopod/tripod for extended observation sessions, but excellent image quality. Brilliant images, great contrast and clarity. Would recommend. I have a 15 X 70 Celestron SkyMaster binos, but I wanted more magnification. I reviewed the specifications of the Zhumell 25 X 100 and the Celestron 25 X 100. Finally I bought the Zhumell because their lens are fully multi-coated, accept 1.25" filters (although my Celestron filters seem to not screw on well), have the same field of view like the Celestron 25 X 100, and they come with a beautiful hard case. I'm very happy with these binos; the image quality is very good and the magnification fantastic. The cons: they are very, very heavy; you will need to buy a very STRONG and TALL tripod if you want to see the sky with them; if you use glasses you will lose about 50% of the view; focusing is done individually in each eyepiece and isn´t fast, so if you want to see birds be sure to dissect them first! Got these binocs for Christmas this morning and although I am 26, I still get into my presents when I know I am not supposed to. I snuck them outdoors the other night and despite the full moon and light pollution, things were awesome. Only had a few minutes before I knew I would get caught so I just peaked at Pleiades and the only word that came to mind was "awesome". Anyways, this morning I took them outside just to mess around. Was easily able to read the license plate on the beat up GMC pick-up down the street at approximately 400 yard as well as the address numbers painted on the curb. Turned the other direction and looked at the eucalyptus grove at about 500 yards away and saw individual leaves on the trees perfectly. Looked at a small cliff face on the mountains about 4 miles away and could make out incredible detail of the cracks and crevices. The woman down the street walking her dog didn't look too bad either. I got these binoculars instead of a telescope because I've been looking at the night sky with binoculars [7x50] for a long time and though I would like a good telescope a good one cost more than I had at the time so after reading the reviews about these huge binoculars I took a chance and wow!! They are very nice but they are huge and heavy, but my first look was at Jupiter and I could see its moons for the first time, very cool - I am very happy. 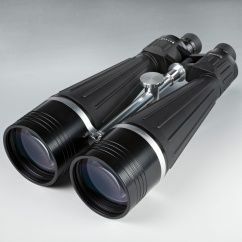 I constantly use my Zhumell Astronomical Binoculars in addition to my 9.25 Celestron telescope. One of my favorite things is to use the binoculars with a parallelogram mount to track fast movers in the night sky including the ISS, satellites, and meteors. 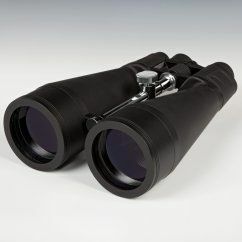 The binoculars are also great for observing the planets and many constellations. My telescope is so big that I rarely take it on vacation. However, the binoculars and mount are portable enough that I can easily pack them in the back of my pickup and head out.